Paris 18th January, 2018. A four member parliamentary delegation headed by Senator Lt. Gen ® Abdul Qayyum, Convener of the Pakistan-France Friendship Group at the Senate of Pakistan and Chairman Senate Standing Committee on Defense Production paid a two-day official visit to France from 16-18 January on the invitation of Senator Pascal Allizard, the President of the Pakistan France Friendship Group in the French Senate. Senator Muhammad Saleh Shah from FATA, Senator Muhammad Usman Kakar from Balochistan and Senator Baz Muhammad Khan from KPK were other members of the delegation. 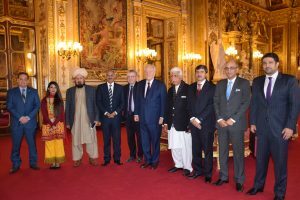 During its two-day stay in Paris, the delegation met M. Christian Cambon, President of French Committee on Foreign Affairs and Defense, Mr. Jean-Bernard Sempastous, President of Pakistan-France Friendship Group in the National Assembly and Mr. Thierry Pflimlin, President of Pakistan-France Business Council. 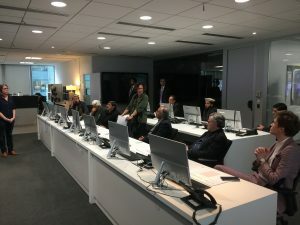 It also received briefings at the French Ministries of Defence and Foreign Affairs and also visited French state Railways SNCF. 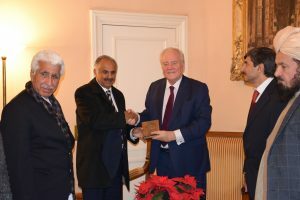 During the meetings, Senator Abdul Qayyum said that Pakistan attached great importance to its relation with France being a key European country and stressed the need to further cement and expand the existing bilateral relations in the fields of commerce, trade and investments, scientific research, energy, environment, education and culture. We encouraged more official exchanges, ministerial visits leading to the visit of French Prime Minister and President to Pakistan. He briefed his French counterparts about Pakistan’s efforts in curbing terrorism. He said that the Pakistani nation through unprecedented sacrifices has defeated the forces of terrorism and extremism, and today Pakistan was on the path of peace and development with an impressive growth rate, infrastructure development and improvement of social sector. 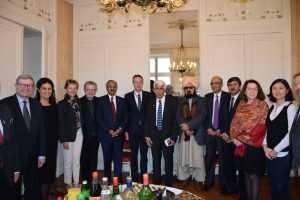 Senators also briefed their French counterparts about the situation in South Asia, in particular the human rights violations in the Indian Occupied Kashmir. 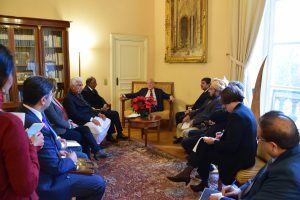 They urged France, being a permanent Member of the United Nations Security Council, to play its role for bringing peace and stability in South Asia and for resolution of Kashmir dispute in accordance with United Nation Security Council Resolutions. 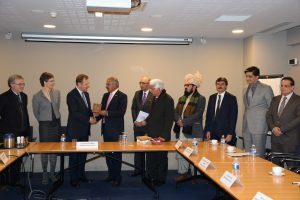 The delegation also visited MEDEF and was received by M. Thierry Pflimlin, President Pakistan-France Business Council. Mr. Pflimlin briefed the senators about the current state of business relations between Pakistan and France. 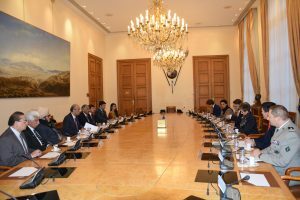 He stated that there was a renewed interest amongst French companies due to impressive economic growth and numerous investment opportunities in Pakistan.